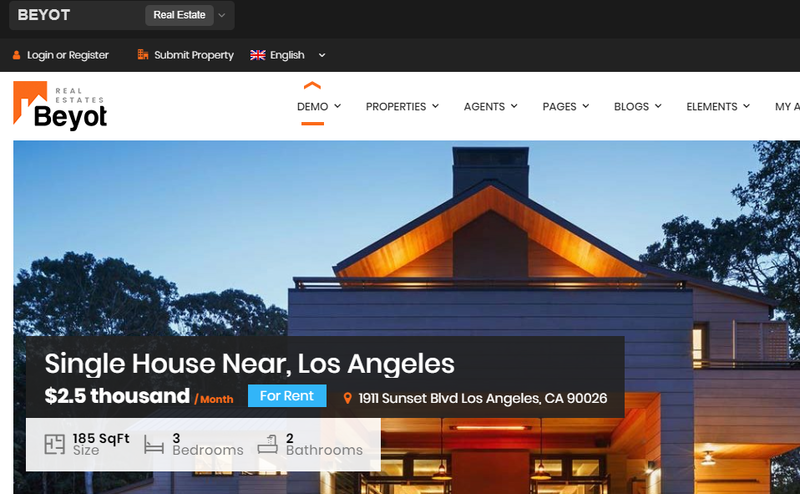 In this post, we are going to cover 20 of the best real estate WordPress themes we could find. You can use any of these in making your own real estate business website. Note that there are A LOT of WordPress themes (paid and free) that you can use, but we’ve chosen some of the best ones out there. Because real estate websites can get quite heavy, with all the listings… make sure you’re running the site on a powerful WordPress hosting service, maybe even consider a managed WordPress host if you have the budget. With the themes listed here, you will be able to make a website that’s beautiful and functional as well. You can, therefore, create a site that can strengthen your credibility and boost your sales. If you’re looking for a website that’s especially designed for real estate companies, agents, commercial and residential developers, apartment managers, and anything related, consider this WP theme. It comes with an impressive design that will surely attract your clients’ interests. So, if you’re using your site for business, this makes for a good choice – especially in terms of earning commissions and profits. PayPal – Simply connect your PayPal account to your WP business site and you’re ready to accept money from anywhere in the world (accredited by PayPal). Wire Transfer – For clients who find the wire transfer method to be more convenient, they can use their bank account information when sending payments to you. Stripe Integration – To use this payment method, just connect your account to the system and you can start accepting payments from your clients using their credit cards. We highly recommend this WordPress theme for your real estate business because it’s really efficient and functional. The features we mentioned above are just a few of its most promising characteristics – it actually comes with so much more. If you want to avoid using codes and shortcodes, consider the MyHome theme. Also, you only need to buy this theme once as it comes with free updates (lifetime). And should you encounter any trouble, their customer support team is also easy to reach. Since this theme comes with WPML feature, you will have a multilingual site to accommodate other nations and countries. As far as accessibility is concerned, rest assured that it caters to users that use PCs, tablets, and smartphones. Dynamic – Current page doesn’t need to be refreshed as the results will show up right away. Classic – Clicking on the search button will refresh the page and show you the results. By Map – Again, this type of search won’t require the page to be refreshed, but will show the property being searched instantly. Active fields are highlighted to make the ready-made options easy to find. You can use the advanced search button for a more accurate and faster transaction. Sort options are available to cater to one’s particular needs. Comes with social buttons (for liking, following, and sharing). It accepts currencies from other countries. As you can see, this is another recommendable theme because of its overall design and functionality. You can even use the integrated page builder if you want your real estate site up and running without using technicalities (codes). Here’s a modern theme that has a clean appearance but functional design. It also comes with a sophisticated layout that’s also responsive to the user’s needs. So, if you want to build a real estate website as an agency or as an agent yourself, keep this theme in mind. Actually, you can use this particular theme for any real estate-related business. Fast loading, to enable your site visitors to find the property they’re looking for faster. Search fields can be set through criteria that suit a particular user’s needs. Autocomplete searching suggestions for faster results. Of course, you can also opt for a free membership real estate website for your users and just monetize your site through other means. We really like this WordPress theme because it has a very functional interface. In fact, it can work and run by itself (out of the package) – that you can use its full features without the need to add plugins and other paid (and free) elements. Saying that, we also want you to know that this theme is SEO optimized. And though it doesn’t require any additional plugins to make it work at its best, the theme is also compatible with SEO plugins. Lastly, should you encounter any problem in putting up and designing your site, Reality Theme’s customer support is always there to help you. This flexible WP theme makes for a good starting point for newbies and expert web designers as it’s simple and professional-looking. It’s also a suitable choice for real estate companies and agents. Needless to say, the search functionality in a real estate site is very important. Through this feature, your users will be able to find an exact match of their desired properties. And so, this theme offers various settings where users can put criteria on the type of properties they desire. To make this task easier and more efficient, the search functions will provide users with suggestions as keywords and property features are entered into the search field. Yes, the Houzez WP theme sure has a lot of things going on in its design and functionality. It even comes with customizable fields – so, you can display (in one page at a glance) all the information that you need to present to your clients. You need a purpose-oriented layout and design when you’re running a real estate business, right? With the Real Homes Theme, you get that and lots and lots of other useful features. Therefore, this is a theme that can be efficiently used both on the back-end side (admin) and the front-end side (user). The makers of this theme promise that more languages will come soon. So, watch out for that. Your site visitors will surely find your site user-friendly when you decide to use the Real Homes Theme. You can use professionally-designed templates even without knowledge of codes so that you can quickly put up a functional site. Free WP Bakery Page Builder – This plugin allows users to make customized layouts on their web pages. Free Revolution Slider – This has been a favorite plugin for web designers as it allows for beautiful presentations of content whether it’s accessed from large-screen computers (e.g. desktop, laptop) or from mobile devices (e.g. tablets, smartphones). One Click demo – This allows you to quickly create your own site by installing a demo template. Google Maps – Aside from the convenient design of having this map integrated into the system, it also comes with property markers to find your users’ preferences easier. Meta Boxes – With this function, you will be able to add and modify property features easily. We also find the Real Homes Theme recommendable because of its many useful features. You can design a unique-looking real estate website with this theme. You can also expect to get help from their customer service people when you need it. As for their Property List feature, this enables users to save their favorite properties, compare properties they’re considering to buy, and create an agents list or agency list. Login and register – To create their own account. Login using social media profiles – To verify identities without having to register to your site or create an account. One-click demo – You can install a template or design from a demo that you like. Free Revolution Slider – This supposed to be paid plugin is included in the theme’s package. Visual Composer – This paid plugin (free with the theme) is also integrated into this theme’s format – and you will find the drag and drop steps easy and time-saving. Shortcodes are supported – If you have coding skills, you can further customize the Benaa theme to suit your needs. We like the Benaa Real Estate WP theme – yes, we really like it and you might like it too. Aside from the tons of features we discussed above, it comes with a responsive design. You can bet on attaining good user experience when you go for this theme. For an all-in-one real estate theme, you can go for the Findeo – it’s a suitable theme for agencies, agents, and directory sites. You don’t need to have coding knowledge to use this particular theme since it comes with a drag and drop system. 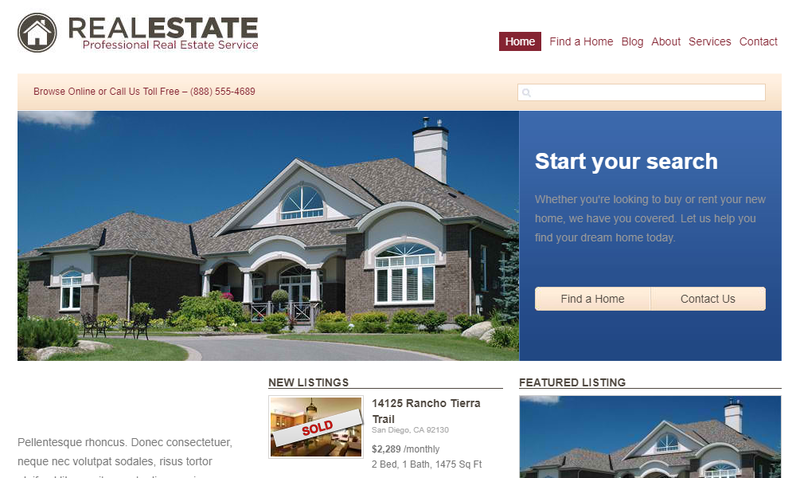 In fact, you can put up a working real estate website in minutes with this theme. Aside from the ability to add, delete, and rearrange elements in a snap, users can also narrow down their search by entering the number of bedrooms, bathrooms, and minimum and maximum areas of the properties they’re searching for. Clients who upload properties can be charged a one-time fee or per upload (depending on the number of uploads) – it’s up to you. You can set up a membership site and charge clients with monthly subscriptions to your site. Automatic notifications – You can notify your subscribers through emails if their listings are approved or nearly expiring. Google Maps integration – This map can be configured according to your input. Multiple-design listing grids – There are various styles of grid designs to choose from. One-click demo installation – You have the option to quickly install from a demo you like. Free Visual Composer Plugin – This paid plugin is included in this theme for free. It’s a drag and drop webpage builder that makes creating sites easier than ever. Free Revolution Slider Plugin – This is another paid plugin that’s included in this theme for free. It’s a popular tool for making a really nice-looking website whether it’s accessed on big screens or small screens. As you can see, this theme is powerful and professional in every way. It’s also mobile-friendly – so, users will really find it easy to access your real estate site for their property needs. 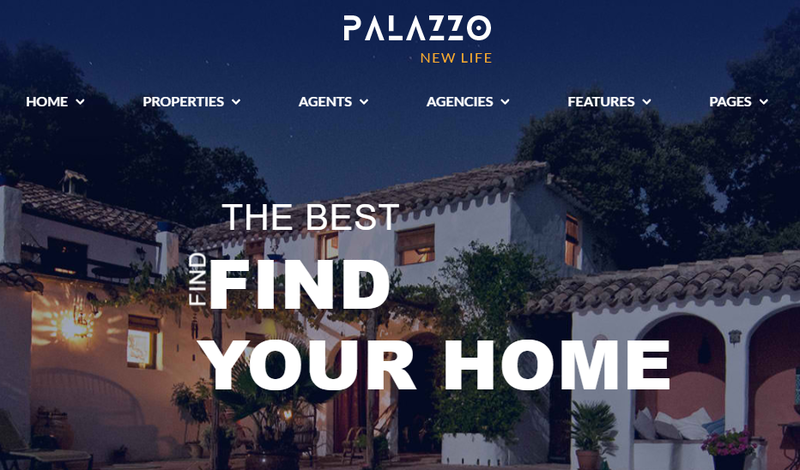 The Palazzo theme is a functional website suitable for agencies, agents, and real estate Companies (in general). It also offers a total of 9 structures for your homepage to choose from. At the front-end, each type of search comes with a different set of criteria. This enables users to input the details that are most important to them. The above plugins are also automatically updated when there are improvements or changes in the codes. So, aside from making them more useful, you can also save on time as you don’t need to manually update them. What we really like about the Palazzo theme is that it’s easy to use for everyone – whether from the front-end or the back-end. The theme options are also customizable to suit the individual tastes of users. 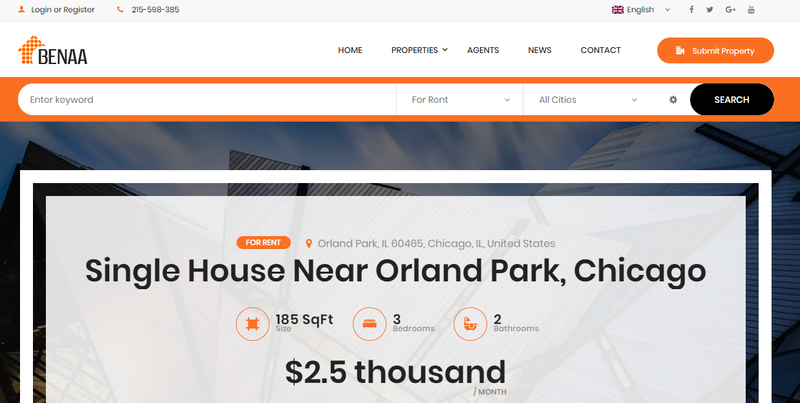 If you’re particularly looking for a real estate WordPress theme that prioritizes the use of maps (for tracking down specific properties), the Nexos theme can be one of your options. Aside from Google Maps (which is a common feature among real estate themes), it’s also integrated with OpenStreet Maps. The front-end usefulness of this theme is also worth mentioning. While registered agents can quickly submit their listings, non-registered users can also do the same (as registration is not required in this particular theme). Therefore, even first-time visitors can submit their listings right then and there. Still, you can choose to disable the above options and simply use their custom-built design. Live messaging – Online users can chat with one another. Customizable search function – In order to narrow down the results to exact matches, you can enter categories in the fields (such as location, size, and price). 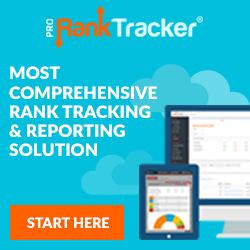 Monetize function – You can earn money by selling services, listing spots, subscription, etc. The theme even has a built-in currency converter. Inclusive of premium plugins – Otherwise paid WP plugins are included in this theme for free such as Visual Composer, Slider Revolution, and Real Estate Portal. Compare listings – 4 listings can be compared side by side all at once. Safety measures – This theme comes with Captcha, login option using a Facebook account, and report abuse option. You can clearly see why this theme made it to our Top 20 list. It’s a stable and fast WP theme that will help your real estate business grow. As a theme that’s especially made for agencies and agents, Realtyspace will make managing your website and dealing with your clients easier. You can also monetize your site with this theme because it comes with a built-in submission system – it’s suitable for both free and paid subscriptions. Listed below are some of the most notable features included in this theme. Landing pages – With the free Visual Composer, you can create professional-looking landing pages quickly and with less effort (no coding required). Premium plugins included for free – Aside from Visual Composer, you also get Slider Revolution and Advanced Custom Fields. Header variations – You can choose from at least 3 ready-made headers. Homepage variations – There are at least 5 options for choosing your site homepage. Ready customer support – You can easily contact the theme’s customer support people as contact information is included in the theme’s details. Responsive layout – You can be assured that your website will look good on big screens (PCs), and small screens (mobile devices). Integrated with Google Maps and Street View – For a more effective searching of properties. Shortcodes – Those who are into coding can tinker with the theme’s column designs, properties section, galleries, and more. Easy to monetize – The theme is designed in a way that clients can submit property listings at the front-end. You can then charge them for this service (through PayPal). Social media login – Users can log into your site using their social media accounts (e.g. Facebook, Google, Twitter, etc.). 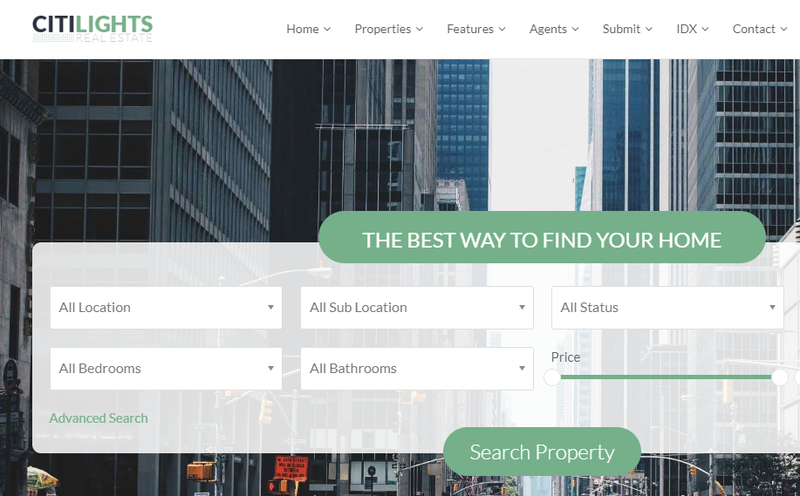 Yes, the Realtyspace theme is indeed loaded with a lot of useful features – and that’s why we like it and recommend it as one of the best real estate themes to use. This theme also comes with multilanguage support – so, the contents can be translated into many languages. As for its overall performance, we can say that it’s fast and efficient. This responsive theme is suitable for making websites for real property agencies and agents. You can also monetize it by adding a member subscription service. Some of its notable features include Google Map integration – so, properties are easily searched and located (yes, it’s a big time saver). In fact, its advanced search function makes it really easy for clients to find the particular property that they’re looking for. Favorite properties – Your favorite property lists can be accessed from your profile dashboard. Compare properties – Clients can compare up to 3 properties side by side. Geolocation – Users can easily find available properties on a specific location. WPBakery Page Builder – Lets you build custom web pages easily. Revolution Slider – This popular plugin will make your website presentable and readable from any type of computer device (PCs, smartphones, etc.). Shortcode ready – If you want to use shortcodes in tweaking your site’s design, you can do so with this theme. WPML Ready – You can target customers worldwide as this theme can be translated into many languages (e.g. Dutch, French, Portuguese, Russian, Spanish, etc.). Multiple Layouts – You can choose from pre-made layouts in designing your website. We are recommending this theme because of its premium look and design – just two of the qualities that can help your online real estate business to grow. Also, its well-loaded features allow for customizing flexibility when creating your site. The Citilights theme also has one of the most reliable customer support system. 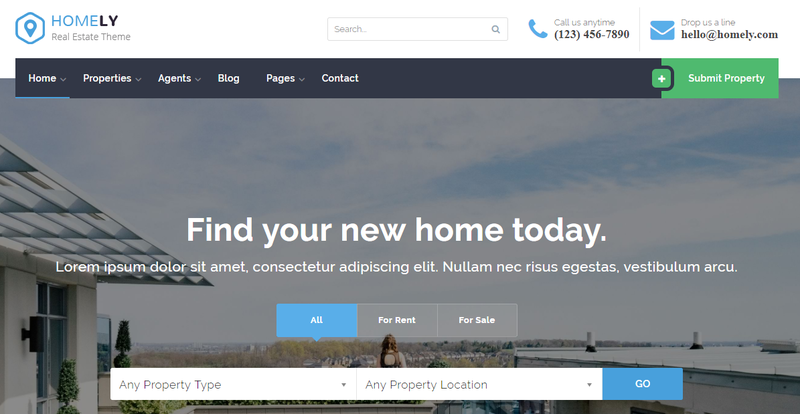 If you want a modern theme for your real estate website, check out the Zuhaus WordPress theme. Aside from its up-to-date design, it also has useful features that would make your site functional, enjoyable, and easy to use. Visual Composer – This page builder makes it really easy to put up a site. Revolution Slider – A lot of web designers use this plugin because it makes websites readable and beautiful when accessed from any device. Stats dashboard – At the Admin’s end, you will be able to track the most visited properties in your listings. User login – Users can register to your website if they want to add property listings under their account. 3 Roles – Each user has a role when accessing your website – Agency, Seller/ Buyer, Agent. The Zuhaus theme is very impressive indeed. Needless to say, it comes with a powerful interface – and yet, it’s user-friendly. Its search function is also efficient as it is neat – thereby making filtering properties fast and easy. This theme certainly deserves its spot in this Top 20 list. If you’re looking for a responsive WordPress theme that doesn’t need any coding, consider getting the Freehold theme. It comes with a lot of features that will make it easy for you to create and use with your real estate business. High resolution – Views from any type (and size) of a screen will come out beautiful – yes, even from a mobile device. Translation ready – Your site’s content can be translated into different languages. Demo importer – You can instantly create your website by copying a demo you liked. Designing made easy – You can include popup messages, maps, etc. Mega menus – You can customize your menus (dropdown) to suit your needs. Customizable footer – You can add your logo, navigation map, and icons on the footer section. Multiple contact forms – Different sections of your site can have different-looking contact forms. Adjustable fonts – You can choose the perfect type of font for your business. No coding skills? No problem – when you go for the Freehold theme. Also, because of its page builder, you can put up a site with just a few clicks. Whether you want a real estate website as an agency, agent, or admin, you will find the Beyot theme to be a strong contender among your choices. In a nutshell, we can say that this particular theme will make property management easy. As the real estate business owner, you can allow your site’s users to register to your website so that they can submit property listings under their account. It’s up to you if you want to offer this service for free – but you can use the same format and charge a fee (if you offer this service as a monthly subscription). Responsive demo – 9 layout patterns come in demos. And if like any particular layout, you can install it as your website design right away. Mortgage Calculator – To make it easy for you and your users, this theme comes with a mortgage calculator. You can easily determine a particular property’s sale price, percent down, terms (in years), and interest rate (in percentage). Favorite properties – Users can easily access the properties they’re interested in. Compare properties – As buyers would want to see their choices, having the capacity to compare properties is an added benefit. Email alerts – Email alerts can be sent to the website admin when a new user registers at the front-end of the site. Revolution Slider – For the best resolution in big and small screen sizes. Visual Composer – Drag and drop technique in creating a customized website. You see, this WP theme is loaded with features and it makes putting up a site quick and easy. 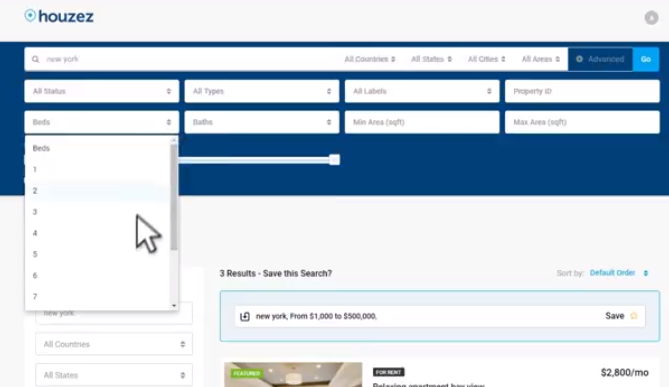 Users, admin and web developers are presented with options on how to search, buy, and sell properties in a very convenient way. And with the multiple methods of payment included in its design, you can easily monetize your site. WP Pro provides its users with a lot of options when customizing their websites. Premium tools are also incorporated in the theme so that you can put up your desired site without needing extra tools. Advanced search – Users can filter their search by inputting categories. The mapping functionality also aids in locating a particular property. Pre-built demos – As of this writing, the theme carries 3 demo structures that can be installed instantly to your site. The maker of the theme also promises more demos soon (free for old buyers). Plugins – The theme comes with Revolution Slider and Visual Composer. These 2 plugins can help you put up a functional, beautiful website. Property Status – You can add property status such as for sale, for rent, sold, rented, etc. Blog functionality – You can add a blog page to your site’s design and immediately make use of it. Customer support – The people behind the WP Pro theme will help you with any issue you encounter (setting up, running, and designing troubles). The WP Pro WordPress theme has a clean and simple design, but it’s a powerful tool in running an online real estate business. Note that this theme allows you to customize your site just the way you like it – without using any codes. And should you decide to get it today, you will still be eligible for future updates. Are you in search of a functional and reliable real estate theme that’s also easy to set up? You might like to consider the Landmark theme – it fits those descriptions and comes with a lot of features as well. Read on to find out more. Home Advanced Search – Simple but functional design to make it easy for users to find the property that they need. Home Map Vertical – A vertical presentation of a map where properties are located along with access to the site’s features. Home Map Horizontal – A horizontal view of the map to pinpoint the exact location of properties. Home Half Map – Half of the page contains the map while selected properties occupy the other half of the screen. 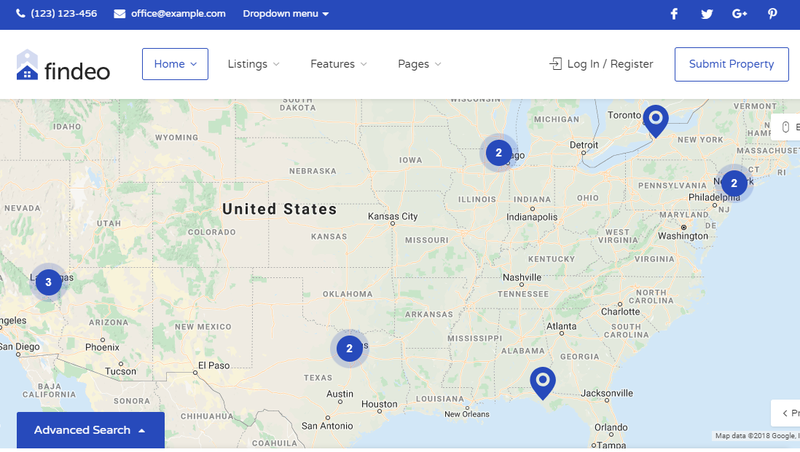 Home Search Map – Map occupies almost the whole screen while thumbnails of selected properties are shown in thumbnails below the map. Home Single Property – One property is displayed at a time. 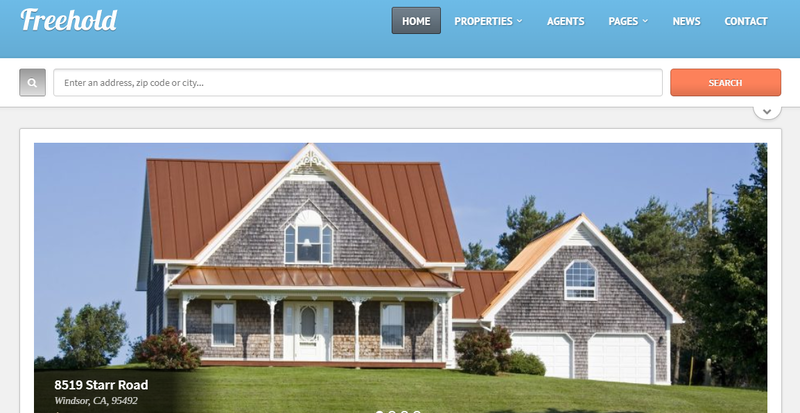 Searching for properties online is made easier with this theme’s multiple search categories. It’s also incorporated with Live Property Search, a feature which enables instant results after criteria fields are completed (there’s no need to click on the search button). With an unlimited number of customizable settings, users can add, edit, and delete features and amenities on the properties they’re looking for. In fact, this theme also allows front-end submissions from users with profiles. And if they don’t have one, they can make one right on the spot so that they can immediately submit their property listings. Note: You can use PayPal for accepting payments (it’s already built into the system). You see, the Landmark WordPress theme have different customizable looks that will work well with your real estate business. Its versatile design also makes your website user-friendly both on the front-end and back-end. And if you’re particular about SEO, this theme is also SEO friendly as it’s coded with search engines in mind. The Zoner theme has a responsive design that even users with mobile devices will find the site clearly and beautifully made (in spite of having small screens). However, this theme is packed with other exciting features that real estate businesses will find useful and profitable as well. This theme is designed to have a user-friendly frontend. Not only can registered users access their properties at the front-end, but they can also manage their account from there. Still, the website administrator can also access the same at the back-end. Maps – It’s integrated with Google Map and also supports OpenStreetMap to make finding real estate properties easier. Free Plugins – It comes with Visual Composer, a drag and drop site creator. You can design your own site without having coding knowledge. Social Login – To make it easy for visitors, they can access your site without having to register – as long as they use their social account for logging in. Translation Ready – It supports WPML so that users from other countries can translate the wordings into their own language. Bookmarking Function – Registered users on your site can bookmark the real estate properties they’re interested in and come back to these later on. At the same time, the admin at the back-end will be able to see users who bookmarked said properties. Membership Option – You can create a membership page for your site’s followers and regular visitors. You can take advantage of this feature by charging membership fees. Payment Systems – For sales done on your site, you can accept payments through PayPal and Stripe – they’re both integrated into the theme’s design. Invoice System – Your clients’ payments are kept in an invoice system to help you monitor these transactions. As far as functionality, design, and features are concerned, we can say that Zoner is indeed one of the best themes for real estate businesses. With this WP theme, you can create a site that will cater to an individual person’s needs in searching for nearby real estate properties. People around the world will benefit from this as well. Here’s another premium WordPress theme that has a user-friendly design. Don’t let its clean façade fool you, however, as it’s loaded with features. It is, therefore, an easy-to-use and profitable theme that can be used in real estate businesses. 2-Header Layout – You can choose to position your business logo either on the middle or on the left side of your main page. Layout – You can choose full-width or boxed. Efficient Front-end – Users can submit property listings at the front-end of your site. And for paid submissions, you can use PayPal to accept money. Compare Properties – When choosing real properties, these can be compared side by side. Visual Composer – Comes with drag and drop technique to easily create your website. Slider Revolution – Your website will have high-resolution output whether it’s viewed from large or small screens. To give you an idea as to this theme’s other features, see the list below. Customizable background color – You can choose a light or dark background. Integrated MailChimp – A ready-made subscribe form is included. Import Icon Font – If you want custom fonts, you can import from Fontello.com. Translate-ready – Users can manually translate the content of your site (.pot file is included in the theme). The theme is also compatible with WPML (paid) and Polylang (free). SEO-friendly – This theme was coded considering SEO – it performs well on search engines. You can surely see why this theme made it to our Top 20. Aside from its elegant and user-friendly design, it’s loaded with features that will help your real estate business grow. If you want to create a professional-looking real estate site without knowing a thing about coding and website design, the ApusHome theme makes for a good choice. It comes with a lot of features suited for agencies and agents themselves – in fact, the possibilities are almost endless. Homepage Layouts – You can choose from 6 layouts when creating your site. 1-Click Installation – Creating a page is made easier as you can import a demo to instantly copy its structure into your own website. With this feature, you can easily put up a functional website quickly (in minutes or hours, depending on the number of elements you decide to use). Advanced Search – With its multiple search criteria, users looking for properties will quickly find the particular property that they’re looking for. Mortgage Calculator – With its built-in mortgage calculator, you don’t need to look for another tool to perform calculations on real estate mortgages. Eye-friendly – Sharp images and readable content always result in good user experience. Compare – Its multiple properties option comes in templates. Users can use these when comparing properties they’re interested in. Free Plugins – This theme comes with 2 of the bestselling plugins in real estate themed websites. Visual Composer is a drag and drop plugin, so you can customize your website’s design as you like (without any technical knowledge on web design). This theme also carries the Revolution Slider, a plugin that makes websites look sharp even when touchscreens are used. Google Map – The theme supports Google Map to assist in locating properties in a certain area. You can create a well-designed and SEO-friendly real estate website when you use the ApusHome theme. It’s the type of theme that can be used by large- and small-scale real estate businesses. Whether you need a site for your agency or you’re a real estate agent or maybe you’re a web designer for real estate Companies, this theme is worth checking out. If you want to prioritize user experience in your real estate website, you can go for the Homely Theme. Because of its clean structure and clear images, your users can appreciate it even when viewing from mobile devices with small screens. Of course, it also comes with other features that you will surely find useful in running your real estate business. This theme comes with a built-in drag and drop interface. You can, therefore, create unique website layouts even if you don’t know a thing about coding. It also carries multiple header styles to choose from – and because of this, your site can be up and running (with presentable design) quickly. This theme’s listing layouts is also nicely presented – you can choose from grid, row, and map. Such options will let you design your site professionally even if you don’t know anything about web designing. You can use Google Map with this theme – it works well as property markers as you and your clients can see the exact location of a particular property. It also comes with a built-in Mortgage calculator to help you estimate a property’s overall cost. 7 Home Pages – Registered users will be able to submit property listings without accessing the admin dashboard. Designing Options – You can choose from their built-in widgets and sidebar styles. As a website designer, you also have the option to use shortcodes in designing the website. Translation Ready – Users from other countries can understand the contents of your site. Blog Layouts – Should you decide to include a Blog section on your website, there are several blog structures to choose from. Unlimited Floor Plans – Users can freely design a property’s floor plan. Customer Support – You can easily access the Theme’s customer support in case you encounter problems. With pre-made templates and design structures, setting up and running a real estate website is a lot easier. You can even mix and match different elements so as to come up with unique pages for your site. The theme is also compatible with popular plugins (e.g. Slider Revolution, Contact Form 7, etc. ), thereby allowing you to really customize your site. We have just presented you with today’s Top 20 Real Estate WordPress Themes – and they’re all good. Therefore, choose the theme that most suits your needs as a real estate Company, agent, or anything related to the industry – and keep your site visitors’ (clients) needs as well. Is Anybody Safe From DDoS Attacks?